“Make the bureaucrat work!” is the slogan of a local campaign [ru] run by the regional Internet news agency, Ura.ru. 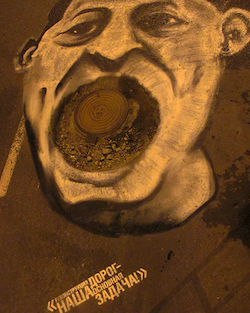 Their solution to the road problem is as simple as it is elegant: They simply spray-paint the portraits of local dignitaries around potholes, with quotes of their promises to fix the problem, and guess what – problem solved! What has taken local politicians years not to do, is now done overnight. The embarrassment of having their portraits so concretely fixed to the potholes of their power, has seemingly made authorities run about like mad to pave over their portraits of impotence, filling the holes in streets and roads.